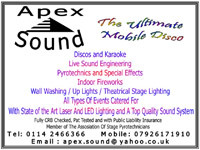 Required by many venues, Apex Sound has a current PLI policy with Mobile DJ Network in the amount of £10 million. Also required by many venues, Apex Sound has supplied satisfactory evidence of holding current PAT inspections of their equipment dated within the last 12 months. Why do people choose to book Apex Sound? Price and description was very thorough on what they could offer. "Callum was great evening went off without a hitch would definitely recommend him and the company and will be using them again "
"Many Thanks For your Kind Words, had a great Night, Thanks Again"
"Brilliant from start to finish. Would highly recommend. " "brilliant and I will be booking Gregg for future events. I have nothing but praise for every aspect of this booking. many thanks apex"
"Was very good and would recommend." "They were both accomodating and polite and serviced requests. Not the tidyest dressed hence the 4 stars. Not much audience mic work, but this was ok for me as I'd rather more music than DJ talking. Karoke was good, however not easy to look through available tracks. Expectation was that guests would know what they wanted to sing and they would find it.. Preference would be to have some lists to choose from as not everyone can remember and sometimes want to do something different. All in all a very good night had by all. Hope this helps. Thanks"
"Many Thanks for your feedback, we have taken it on board and will look into the points mentions to improve our service for the future." "John was very good. He had a warm friendly personality. He played all the requests and chose some good music which suited the mixture of guests." 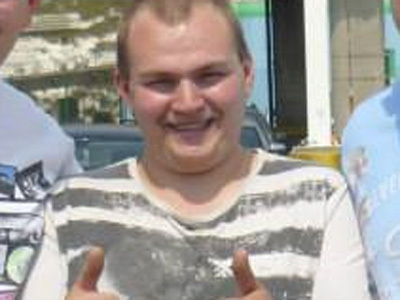 "Thanks for your feedback, we have passed your kind words onto John"
"Great communication right from the start. Offered us the chance to create our own play list, took requests, and none of the cringey DJ talk through the night. Perfect!" "Thanks for your kind words, we are glad you enjoyed your party :)"
"Very Nice Guy came to do the Disco, thank you Calum. For future bookings Apex Disco may want to provide the details of the contract before asking for a deposit, otherwise customers will not know that the deposit is non refundable before they end it. Not needed in our case as we were very happy with the job Calum did for us." 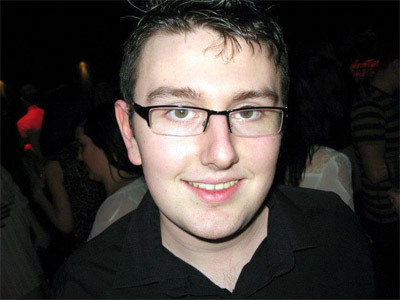 "Many Thanks for your kind words, We have passed them onto Callum. Regarding our booking procedure, that is defiantly something we will look into for future bookings. Thanks Again :)"
" Excellent.... Couldn;t have been better and excellent value for money too"
"Many Thanks for your kind words :)"
"We found Apex very helpful and pleasant to deal with." "Many Thanks for your kind words, we are already looking forward to next year :)"
"The DJs were extremely professional and took all requests on the night as well as setting up a meeting beforehand to get a pre-made playlist. They were friendly and provided excellent service." "Many Thanks for your kind words. We are glad you enjoyed your party and found our book process simple and profession, Thanks again :)"
"The DJs were very approachable, accepted requests without hesitation and played some fantastic music. Many people at my party commented on how good the music was and said the DJs were very good." "Many Thanks for your kind words, we are glad you and your guests enjoyed your selfs at your the party. Thanks Again :)"
"Fantastic, professional & accommodating dj would highly recommend :)"
"Thank you very much for your kind words, and Many thanks for your recommendations, We look forward to working with you again"
"Apex made my night a night to remember. They were friendly and really welcoming which was important to me. I recommend them to absolutely everyone because you will not be disappointed." "Many Thanks for your kind words, we are glad you enjoyed your self and look forward to working with you again in the future." "Very pleased with the service and thanks for a straightforward booking process"
"Many Thanks For Your Kind Words." "The music choices were perfect for the audience. Unfortunately the DJ was very quiet, rarely speaking on the microphone and when he did speak you could barely hear him." "Really happy with what I received. My only issue was that we had to ask a few times for him to announce the buffet. This was not done so we had to go round and tell everyone ourselves." "Not as good as other DJs seen. Not good value for money. Not enough microphone use. Would not recommend or use again." Apex Sound also offers a range of additional party services not directly linked to musical entertainment. Please note that needadisco.com has no editorial control over these images which are stored on flickr.com. If you have any concerns about what you see below, for example potential copyright infringement or unsuitable content, you should take this up with Apex Sound directly using the Contact section below, or else you may alert flickr.com directly quoting "set number 72157642247306094". You may contact Apex Sound directly using this form. If you are contacting Apex Sound about an event, it's always a good idea to include the DATE, LOCATION, EVENT TYPE, AGE GROUP and TIMINGS to speed things up!